The Pier at Harwich01255 241212work01473 617614fax HotelThe Pier was built in 1862 in the style of a Venetian palazzo to provide overnight accommodation for passengers travelling by train and ship to the Continent. The Great Eastern Railway’s terminal was the Ha’Penny Pier (the cost of entry in those days). Gerald Milsom bought the Pier in 1978 and opened a seafood restaurant. It is wonderfully situated on the seafront overlooking the harbour at the confluence of the Stour and Orwell rivers. Across the water is Shotley Yacht Marina with Felixstowe in the distance. The Pier underwent a large and exciting refurbishment in 2016 with changes to the ground floor bar and first floor restaurant. Welcome additions are a lift and extension to the balcony to include tables to soak up the view. The Pier is open all day every day serving local fish and shellfish landed in the harbour some 20 feet from the restaurant. Seven of the en suite bedrooms are in the main building, seven in the adjacent Angel, all very attractive with a nautical flavour and panoramic sea views. The Angel also has a comfortable sitting room, with bar & eating area, and large screen TV. Sailing from the Ha'penny Pier can be arranged. Harwich is also the home of the Mayflower and is playing a large part of the historic 2020 celebrations with the building of a replica ship. The Pier was built in 1862 in the style of a Venetian palazzo to provide overnight accommodation for passengers travelling by train and ship to the Continent. The Great Eastern Railway’s terminal was the Ha’Penny Pier (the cost of entry in those days). Gerald Milsom bought the Pier in 1978 and opened a seafood restaurant. It is wonderfully situated on the seafront overlooking the harbour at the confluence of the Stour and Orwell rivers. Across the water is Shotley Yacht Marina with Felixstowe in the distance. 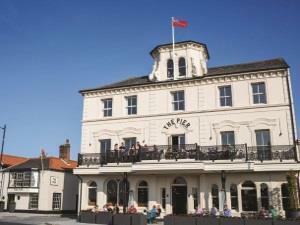 The Pier underwent a large and exciting refurbishment in 2016 with changes to the ground floor bar and first floor restaurant. Welcome additions are a lift and extension to the balcony to include tables to soak up the view. Follow A120 from Colchester to Harwich quay and The Pier at Harwich is on the right-hand side. From Harwich town station, turn left at High Street. Follow road to the Quay, turn right and walk 200yds. The pier is opposite RNLI Lifeboat Station.